The House of David Museum is a museum devoted to securing pieces of their famous past no matter if it had to do with the world-champion long haired bearded baseball teams; the world famous orchestras and bands; the worlds largest cold storage facility; the famous 500 acre amusement park with 8 miniature trains 2 miniature race track and cars all made right at the House of David; the zoo with animals from around the world (even back in the 1905 era); the world famous waffle cones and ice cream which was first patented right there on the House of David grounds; the fabulous art work which was sent the world over with its unique pearlized finish and magnificently carved sculptures, statues and wall plaques, also featuring the 1st known use of blue, gold, green and orange beveled mirrors as backgrounds for these beautiful pearl-ivory pieces. The House of David, founded in 1903 by Benjamin and Mary Purnell, is located in Benton Harbor, Michigan U.S.A. Beginning with a handful of brilliant minds and hard working people, the religious colony grew to over 1000 members in its most ambitious era during the 1930's. Having worked the Chicago World's Fair for two full years (1933-1934) the colony was able to tap into an endless tourist trade with this western side of Lake Michigan and after the World's Fair the traffic coming off the once famous cruise ships (which used to line the ship canals of the Great Lakes) was almost more than even a large city could accommodate. 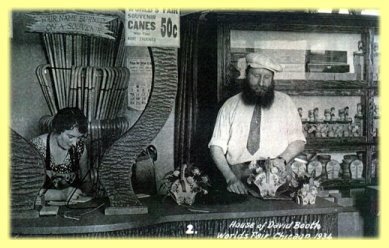 From their own hotels, hospital, green houses, bus line, trolley car line, restaurants, and the biggest tourist court in America at the time, the House of David did all they could to capture the imagination of the American tourists and sightseers and give them something to talk about for years to come. Their strong religious beliefs in long hair and unshaven faces made them talked about the world over. But because of their belief in celibacy, there now exists only 7 living members all in their 80's and 90's.